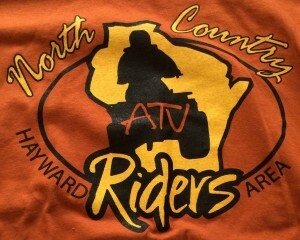 The North Country Riders ATV Club is a non-profit club established in June 1998 in response to a growing need to provide and maintain trails for ATVs in Sawyer County and Southern Bayfield County. Our goal is to develop a safe and ecologically responsible ATV Trail system to connect with trail systems in surrounding counties. Trail maintenance is done by volunteer club members who work with the Snowmobile and ATV Alliance, state and local authorities on projects concerning trail systems. Our meetings are the firth Thursday of the month. The North Country Riders ATV Club was instrumental in setting up trails into and through the City of Hayward. Please support our work by joining our club! Annual Membership fees are: $15.00 Individual, $25.00 Family, and $50.00 Business.